He gains everyone’s approval who mixes the pleasant with the useful. In Ars Poetica (c. 18 BC), line 343. As translated and cited in Alan L. Mackay, A Dictionary of Scientific Quotations (1991), 123. But how is one to determine what is pleasing to God? ... Whatever is unpleasant to man is pleasant to God. The test is the natural instinct of man. If there arises within one’s dark recesses a hot desire to do this or that, then it is the paramount duty of a Christian to avoid doing this or that. And if, on the contrary, one cherishes an abhorrence of the business, then one must tackle it forthwith, all the time shouting ‘Hallelujah!’ A simple enough religion, surely–simple, satisfying and idiotic. I have a friendly feeling towards pigs generally, and consider them the most intelligent of beasts, not excepting the elephant and the anthropoid ape—the dog is not to be mentioned in this connection. I also like his disposition and attitude towards all other creatures, especially man. He is not suspicious, or shrinkingly submissive, like horses, cattle, and sheep; nor an impudent devil-may-care like the goat; nor hostile like the goose; nor condescending like the cat; nor a flattering parasite like the dog. He views us from a totally different, a sort of democratic, standpoint as fellow-citizens and brothers, and takes it for granted, or grunted, that we understand his language, and without servility or insolence he has a natural, pleasant, camerados-all or hail-fellow-well-met air with us. In The Book of a Naturalist (1919), 295-296. It is not merely as an investigator and discoverer, but as a high-principled and unassuming man, that Scheele merits our warmest admiration. His aim and object was the discovery of truth. The letters of the man reveal to us in the most pleasant way his high scientific ideal, his genuinely philosophic temper, and his simple mode of thought. “It is the truth alone that we desire to know, and what joy there is in discovering it!” With these words he himself characterizes his own efforts. From History of Chemistry (1899). As quoted in Victor Robinson, Pathfinders in Medicine (1912), 121. It is so easy to believe in pleasant impossibilities. In novel, Half a Million of Money (1865), Vol. 2, 122. Aphorism as given by the fictional character Dezhnev Senior, in Fantastic Voyage II: Destination Brain (1987), 71. Marly 30 July 1705. From all I hear of Leibniz he must be very intelligent, and pleasant company in consequence. It is rare to find learned men who are clean, do not stink and have a sense of humour. From Letter (30 Jul 1705), to Sophie of Hanover, in Maria Kroll (trans. ), Letters from Liselotte: Elisabeth-Charlotte, Princess Palatine and Duchess of Orléans, "Madame" 1652-1722 (1970), 131. Also seen in Alan L. MacKay, A Dictionary of Scientific Quotations (1991), 175. Also seen attributed to Charles-Louis de Secondat Montesquieu, in Alan L. MacKay, Dictionary of Scientific Quotations (1977), 175, citing Letter LXVI (30 Jul 1705) in Les Lettres Persanes. However, Webmaster does not find this quote when looking at Letter LXVI in Les Lettres Persanes (1721), text prepared by André Lefèvre (1873). (Can you help). 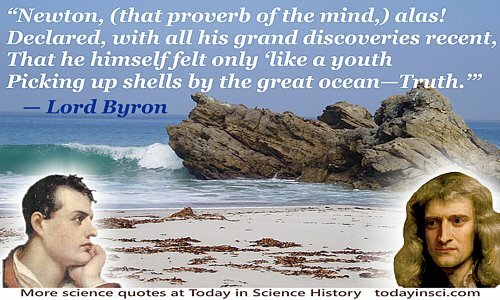 Science which is acquired unwillingly, soon disappears; that which is instilled into the mind in a pleasant and agreeable manner, is more lasting. Each Man of Wisdom, future, past, or present. Newton, (that Proverb of the Mind,) alas! From poem, 'Don Juan,' (1822), canto 7, verse V. In Lord Byron, Don Juan: Cantos VI, VII and VIII (1823), 67. The mathematician can afford to leave to his clients, the engineers, or perhaps the popular philosophers, the emotion of belief: for himself he keeps the lyrical pleasure of metre and of evolving equations: and it is a pleasant surprise to him and an added problem if he finds that the arts can use his calculations, or that the senses can verify them, much as if a composer found that sailors could heave better when singing his songs. In 'Revolution in Science', Some Turns of Thought in Modern Philosophy (1933), 81. When coming to close quarters with a skunk … one has to fear from an encounter; the worst is that effluvium, after which crushed garlic is lavender, which tortures the olfactory nerves, and appears to pervade the whole system like a pestilent ether, nauseating one until sea-sickness seems almost a pleasant sensation in comparison. In The Naturalist in La Plata (1892, 1895), 116-117.